Culture Minister Regev promises approval of 500 new homes, industrial zones, after Independence Day. 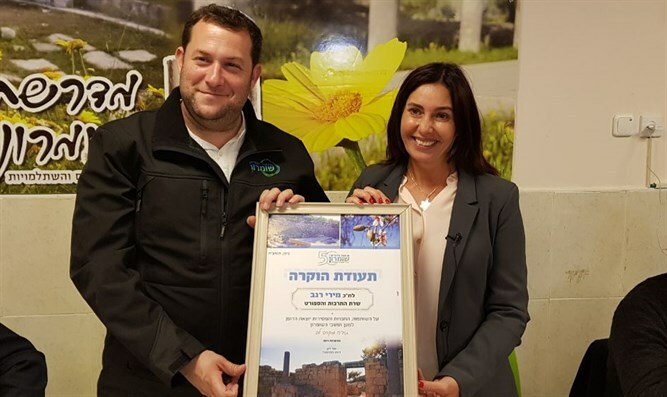 Culture and Sport Minister Miri Regev (Likud) participated in a toast held by Samaria Regional Council Head Yossi Dagan, Settlement Division Chairan Gael Greenwald, Samaria Regional Council Deputy Head Davidi Ben-Zion, and the leaders of towns in the area. Regev emphasized that expanding the building in Judea and Samaria is an integral part of building Israel. "We returned to Samaria, we came home," she said. "Even if they dig very deep, they will not find a Palestinian coin here. On the other hand, we see our history here - the ancient Kingdom of Israel, which was here in Sebastia." According to Regev, immediately after Independence Day, 500 new housing units will be approved for construction in the town of Har Bracha. "We need to build, and to return Jewish life to these areas," she said. "We will ensure that there are building permits for industrial zones, because life requires work and employment." Previously, Dagan had said that residents of Judea and Samaria have felt a small change since US President Donald Trump entered the White House. "But it's a lot less than we could do, considering the fact that he doesn't see the settlements as an obstacle to peace, like his predecessor did," Dagan noted. Dagan also emphasized that the prohibition against building industrial zones in Judea and Samaria is a very "difficult decree" for those living in the area. "Other than the fact that this harms building in Israel, it also harms the employment options of Israelis living in the area, and it harms the Arabs and their economy," he noted. "We expect that after Pesach (Passover), hundreds of new housing units will be built in Har Bracha in response to the murder of Itamar Ben Gal. The settlements cannot accept a situation in which there is no appropriate response to such a horrific terror attack." Greenwald said, "We need to bring Tel Aviv closer to Samaria. If we could bring every Israeli to 'Israel's porch' in Peduel, to see the center of Israel from there, and to see how close Peduel is to the center of the country, the entire discussion about the future of Judea and Samaria would be different."